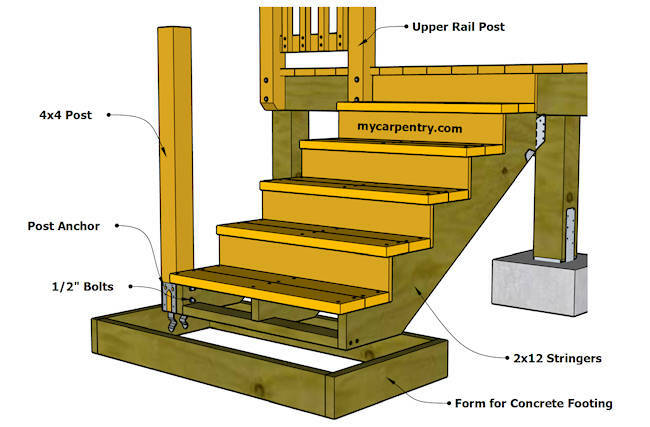 Install Stair Railing, part 7 (of 7) of the 10x10 deck example, will show you how to install stair railing to stairs that were built using part 5 (Build Deck Stairs) stair building tutorial. 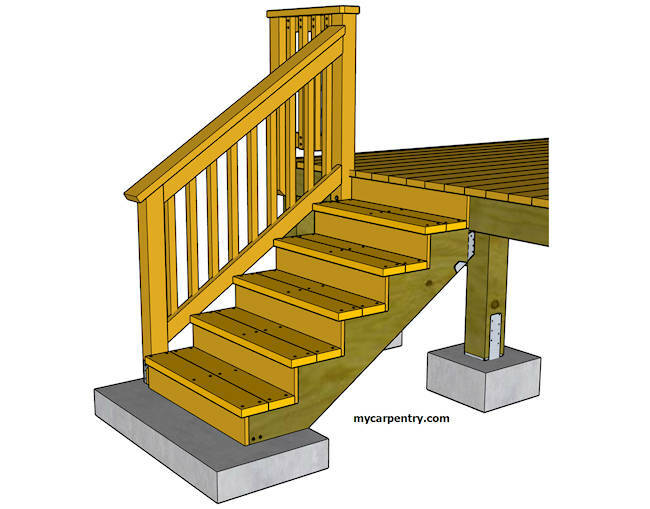 Stair railing should be required if your deck is 30" (762 mm) or more above the ground. Always check your local building code before building a deck. The Prescriptive Wood Deck Construction Guide by the American Wood Council is an excellent source for deck building codes. 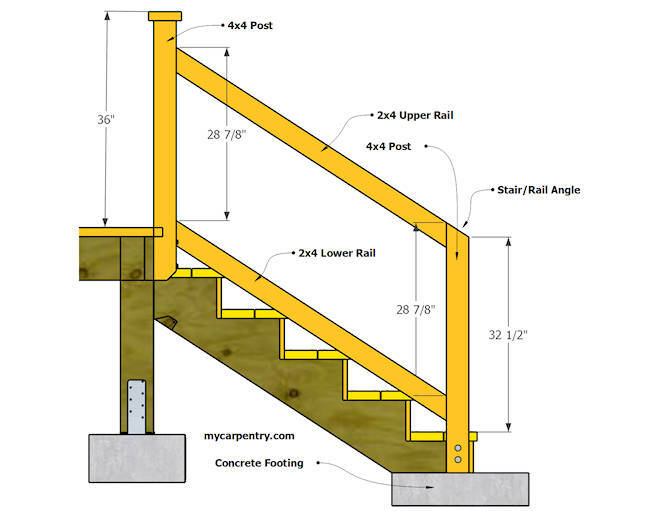 This tutorial assumes that stair stringers have been cut and attached to the deck, and that concrete has not yet been poured at the base of the stairs (as shown in diagram [B]). Further, it assumes that at least one section of deck railing is installed where there is an upper post at the top of the stairs. Cut a section of 4x4 rail post material about 4 feet long (1219 mm) and attach a galvanized post anchor to one end. Attach the 4x4 post to the first step of the outer stringer using two 1/2" carriage bolts (see diagram [B]). Once the posts are attached at the base of the stringers and the concrete is poured, make sure that the posts are perfectly plumb before the concrete sets up. Once the concrete has cured, it will be safe to mark and cut the posts without fear of knocking them out of plumb. When the posts are ready, place an uncut section of 2x4 rail material across the tread nosing, up against the 4x4 posts. Make a small pencil mark (referred to as Ref. Points in diagram [C]) on the front and back of the lower post, and on the front of the upper post, where the posts intersect with the top of the 2x4 rail material (diagram [C]). You can also determine the Stair/Rail angle by placing a Speed Square at the point of where the 2x4 and 4x4 intersect. 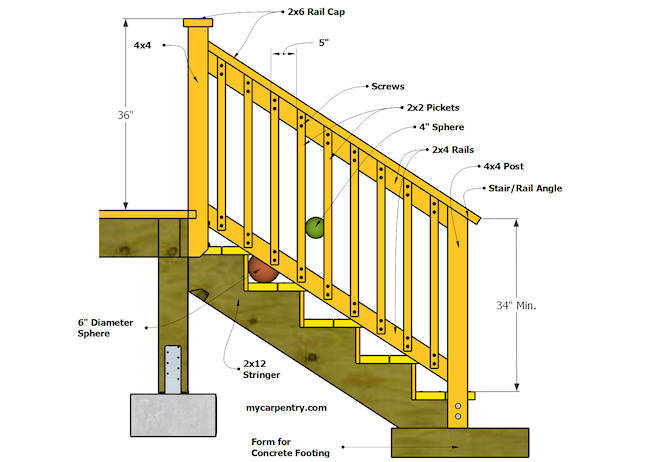 Note: If you used the stair calculator, the Stair/Rail Angle is provided in the calculation. Place the 2x4 rail material tight against the posts and mark the inside face of it along both upper and lower 4x4 posts. Cut it and use it as a template for the second rail. On the front of the lower post, make a small mark at 32 1/2" from the top of the tread on the first step. From that Upper Ref. Point (diagram [C]), mark the rail angle on the post. Transfer the marks around the post and cut it with a circular saw. Note: When you add the 1 1/2" (38 mm) 2x6 rail cap to the 32 1/2" (825 mm) post, you get 34" (864 mm). This is the minimum recommended rail height. Once the angle has been cut on the top of the lower post, measure (on the front of the post) the distance between the lower Ref. Point to the angle cut (shown as 28 7/8" in diagram [C]). To determine the position of the upper 2x4 rail on the upper 4x4 post, transfer that same measurement to the upper post as shown in the diagrams. Note: The 28 7/8" measurement used in the diagrams is just for reference. Your Ref. Points will likely be different. This measurement is only used to determine where the upper rail will attach to the upper post. 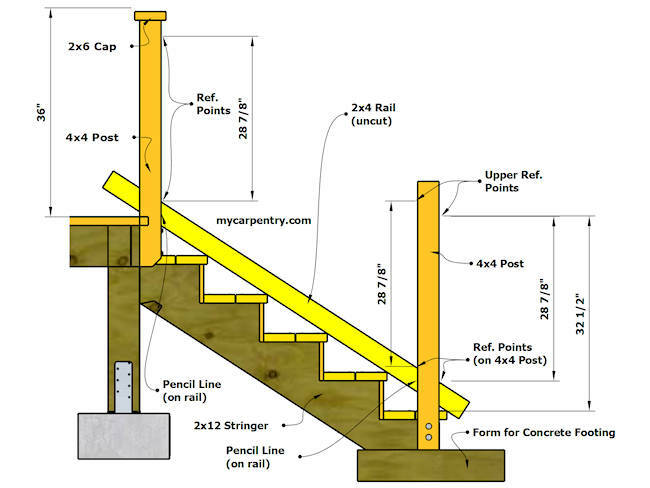 The vertical position of the lower 2x4 rail does not have to be as shown in the diagrams. The only important factor is that a 6" (153 mm) sphere should not be able to pass between the steps and the lower rail. Attach the upper and lower 2x4 rails to the 4x4 posts, as shown in diagram [D], using two 3-inch deck screws at each end. Layout for the pickets is the same method used on the Deck Railing (6) section of the 10x10 deck tutorial. Basically, find the center between 4x4 posts, and @ 5" centers, determine run-out on the pickets to make sure the end pickets will not fall too close or too far away from each post. The spacing of the pickets should not allow the passage of a 4 3/8" sphere. 5" on center spacing should be more than adequate. Of course, there are many ways to install stair railing. The above method is one that I have used many times and always works well.